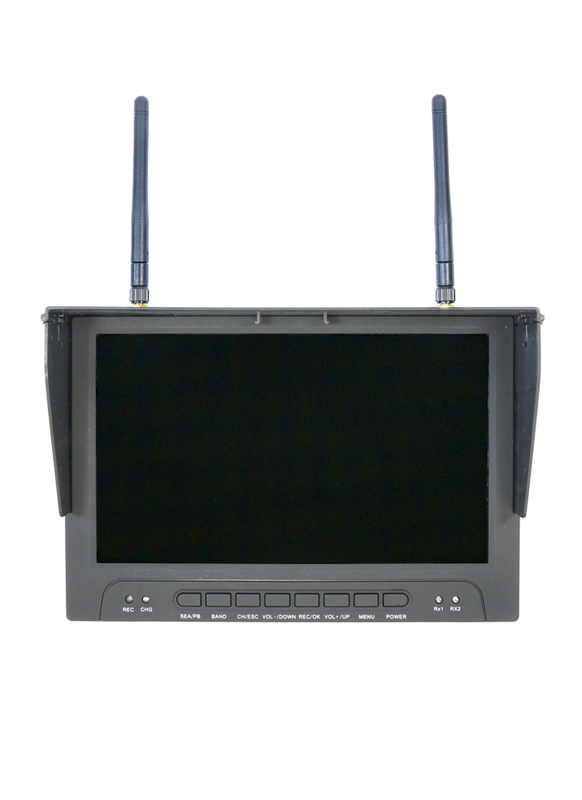 The RC900 boasts the biggest screen size of all the FPV monitors we sell. It has a 9-inch display, which when compared alongside a 7-inch display is quite a lot bigger than it sounds - see the comparison picture below. The large screen size makes the monitor ideal for those doing aerial photography and it looks professional too. The screen itself has a high resolution (1024x600) LCD display, which is bright and clear with good contrast. It comes supplied with a removable sun shield for even greater clarity outdoors. Also, it doesn't suffer from "blue screen" - a problem with many non-FPV monitors whereby if signal strength dips, even for a split second, the screen turns blue! When this monitor suffers from a signal interruption it just shows static and hence this feature allows you to fly much further without losing the image and potentially your drone! The monitor feature an in built 5.8GHz diversity receiver (Rx) making it FPV ready. A diversity Rx is essentially two receivers in one. In essence, this allows you two mix and match antennas for a solid video link. So it might be that you select a circular polarised omnidirectional antenna, which will provide good reception in all directions in the near field, and a directional high gain patch antenna for long distance flights. The diversity receiver is clever in that it will seamlessly switch between the receiver with the strongest signal. The RC900's diversity receiver operates over 5 bands, including RaceBand and boasts 40 channels making it compatible with most FPV gear, including ImmersionRC, Fat Shark, Boscam amongst others. If you want to use the monitor to receive none FPV frequencies, there is an AV input and a HDMI input, so you could simply use the RC900 as an external display for other devices. In addition to the diversity RX, the RC900 has another useful function, namely a DVR. The built in DVR lets you record and play back your flight for you and your mates to enjoy over and over again. More importantly, the DVR could also be a lifesaver for your model. Couple your FPV setup with a OSD (on screen display) and if you lose your model, play back the video to get the GPS coordinates of the crash site. Note that the DVR requires a micro SD card to record footage (supports up to 32GB). The monitor can be powered from an external supply (7-28v) or from its removable battery (spare available here). The monitor also features a 1/4-inch screw thread, so you can mount it to a regular photography tripod for best viewing.